Ancient Thrace: Myth and Reality. We remind you that the deadline for submitting your registration form and abstract is December 31, 2016, or two months from now. You should register online on the congress site (pressing “Registration” on the left pane and again “Registration” on the page this opens or on the flying sub-menu should bring you to the registration form. You should also upload your abstract to the congress site, pressing “Registration” on the left pane and then the button “Upload your abstract” on the page this opens or on the flying sub-menu will bring you to a page where you can do this; you will be invited to create an account before you can proceed with the upload. The procedure is not too complicated, but in case you have any difficulty in creating an account or uploading your summary on the congress site, please send it as a simple e-mail attachment to our e-mail address, <thracology.2017@gmail.com>. Your abstract should be written in one of the congress languages (English, French or German), preferably the same language in which you will present your communication. The abstract should begin with the exact title of the communication followed by your name. The text should not exceed 500 words and should present the main subjects and problems discussed in the communication. The abstract should be uploaded in Microsoft Word file format (.doc or .docx). For text in ancient Greek or other rare languages please use Palatino Linotype or another Unicode font. The abstracts will be published on the congress site. Contributions concerning any aspects of and approaches to Thracian antiquity are welcome. Thracian and related history, archaeology, art, culture, language, religion, numismatics, epigraphy and interdisciplinary studies will be among the fields and topics discussed, in a time-span ranging from the Bronze Age to Late Antiquity. The actual program of the congress will be established in January, after the end of the registration process, and will also be published on our website. It is at the same time, in January, that information and instructions on the transfer of the congress fee as well as details of travel and accommodation possibilities and of the congress excursions previewed will be published on the website of the congress. We remind you that the congress fee will amount to 50 Euro if payed by March 31, 2017, or 75 Euro if payed later; a reduced congress fee of 30 Euro before and 45 Euro after March 31 will be expected from young scientists who would not have completed 35 years of age by September 2017. Please forward this letter to any of your contacts who you think might be interested in participating in the 13th International Congress of Thracology. 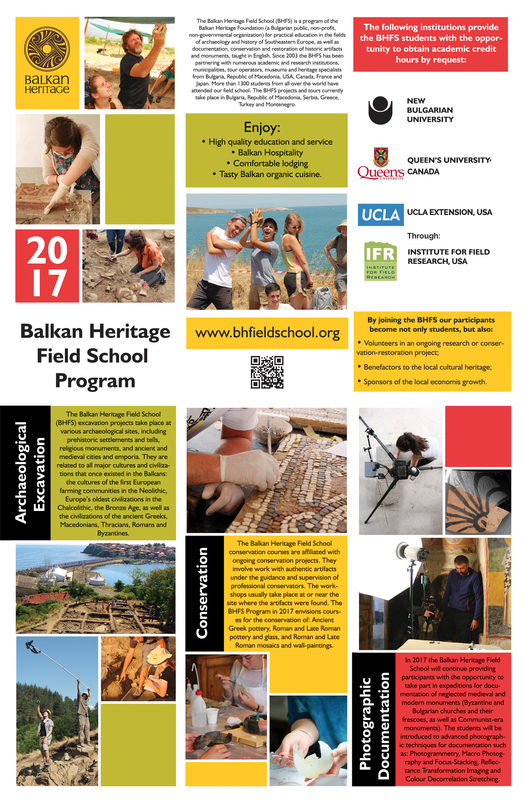 I am pleased to announce that the Balkan Heritage Field School (BHFS) has just opened the application session for the first available projects in the next field school season in 2017! You can find more detailed information about the available field schools and offers in our brochure and poster for Season 2017. 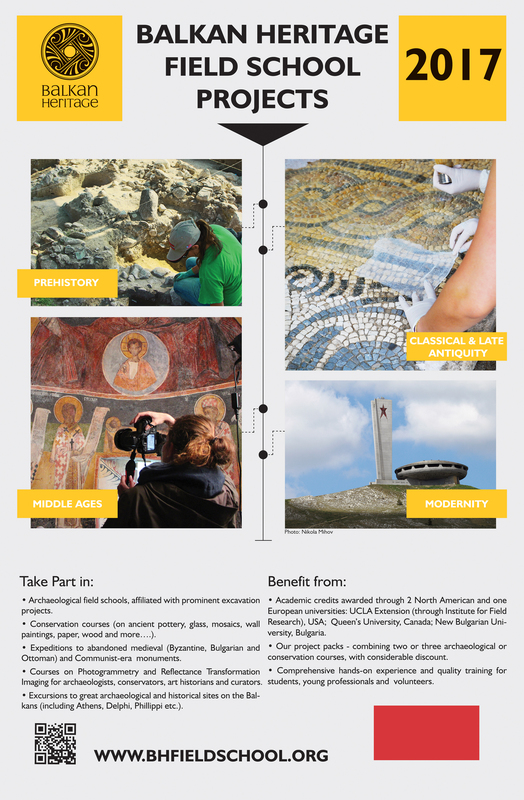 The available projects/courses take place at different excavation sites and historic places in Bulgaria and Republic of Macedonia related to all major cultures and civilizations that once existed in the Balkans; starting with the first Neolithic farmers in Europe and Europe’s first civilization in the Copper Age, the collapsing Late Bronze Age civilizations of the Aegean, followed by the Ancient Greek, Thracian, Roman, Byzantine, Bulgarian, and Ottoman civilizations. Along with the excavation projects, there are conservation workshops/courses currently available on ancient Greek pottery, Roman and Late Antique pottery and glassware, mosaics and wall-paintings based on work with authentic artifacts. New projects in maritime archaeology, vernacular Balkan architecture, conservation of artifacts in Greece, as well as a new Roman dig in Montenegro will be available in the upcoming weeks. Be sure to check out our website at: http://www.bhfieldschool.org for news, exciting surprises and great deals for the new season! Academic credits are available upon request to students participating in the BHFS through our academic partners in EU, USA and Canada. We are pleased to announce the 16th annual Context & Meaning Graduate Student Conference, taking place at Queen’s University from Friday, January 27th to Saturday, January 28th, 2017. We are seeking papers that address this year’s theme, “On the Fringe”. The conference will provide an inclusive and broadly defined forum that facilitates academic discussion while encompassing an abundant range of topics. In choosing this intentionally multi-disciplinary theme we would like to encourage discussion about pushing boundaries, unconventionality, and controversy within Visual Culture studies such as Art History and Art Conservation. We also encourage graduate students working in Art Conservation, Studio Art, Digital Humanities, Cultural Studies, Museum Studies, Religious Studies, Gender Studies and students from various Humanities fields whose research responds to this year’s theme to apply. This conference is open to both historical and contemporary topics. Submissions are welcome from current graduate students, as well as those who have completed their graduate studies within the last year from across Canada and the United States. In light of our theme, we seek to assemble a diverse group of scholars in order to foster interdisciplinary discussions. Presenters will be allotted 20 minutes to deliver their papers, followed by a 10 minute discussion period. If you are interested in speaking or performing at Context and Meaning XVI, please email an abstract of no more than 300 words with the title of the paper, along with a separate document that includes a 250 word bio, to gvca@queensu.ca. As a blind panel will review all submissions, please ensure that your name and the title of your paper are included in your letter of introduction, but that your name and other identifying marks are left off the abstract. The deadline to submit an abstract will be: Friday, November 4th, 2016. We thank all that apply and will contact both successful and unsuccessful applicants during the week of December 12th, 2016. NEH Fellowship: One to two awards of four to six months for scholars who have a Ph.D. or have completed their professional training. Fields of research include: modern and classical languages, linguistics, literature, history, jurisprudence, philosophy, archaeology, comparative religion, ethics, and the history, criticism, and theory of the arts. Social and political scientists are encouraged to apply. Applicants must be U.S. citizens or foreign nationals living in the U.S. three years immediately preceding the application deadline. The award for six months is $25,200. Awards must be used between August 15, 2017 and December 31, 2018. ACOR-CAORC Post-Graduate Fellowship: Two or more two- to six-month fellowships for post-doctoral scholars and scholars with a terminal degree in their field, pursuing research or publication projects in the natural and social sciences, humanities, and associated disciplines relating to the Near East. U.S. citizenship required. Maximum award is $32,400. Awards must be used between August 15, 2017 and December 31, 2018. Funding for this fellowship provided by the U.S. Department of State’s Bureau of Educational and Cultural Affairs. ACOR-CAORC Fellowship: Two or more two- to six-month fellowships for masters and doctoral students. Fields of study include all areas of the humanities and the natural and social sciences. Topics should contribute to scholarship in Near Eastern studies. U.S. citizenship required. Maximum award is $23,800. Awards must be used between August 15, 2017 and December 31, 2018. Funding for this fellowship provided by the U.S. Department of State’s Bureau of Educational and Cultural Affairs. James A. Sauer Fellowship: One award of $1,250 open to enrolled graduate students of Jordanian citizenship, studying in Jordan or another country, and participating in an archaeological project or pursuing independent research in Jordan. This cycle the fellowship is open only to enrolled graduate students of Jordanian nationality. Kenneth W. Russell Fellowship: One award of $1,800 to support a graduate student (any nationality except Jordanian) for field work or participating in an ACOR approved archaeological research project. This cycle the fellowship is open to enrolled graduate students of any nationality except Jordanian. Frederick-Wenger Memorial Endowment: Two awards of $1,500 to assist a Jordanian student with the cost of their education. Eligibility is not limited to a specific field of study, but preference will be given to study related to Jordan’s cultural heritage. Candidates must be Jordanian citizens and currently enrolled as undergraduate or graduate students in a Jordanian university. Jordanian Graduate Student Scholarship: Four awards of $3,000 each to assist Jordanian graduate students with the annual costs of their academic programs during the period May 1, 2017 through May 31, 2018. Candidates must be Jordanian citizens and currently enrolled in either a Master’s or Doctoral program in a Jordanian university. Eligibility is limited to students in programs related to Jordan’s cultural heritage (for example: archaeology, anthropology, linguistics/epigraphy, history, conservation, museum studies, and cultural resource management related issues). Awardees who demonstrate excellent progress in their programs will be eligible to apply in consecutive years. Jordanian Travel Scholarship for ASOR Annual Meeting: Two travel scholarships of $3,500 each to assist Jordanians participating and delivering a paper at the ASOR Annual meeting in mid-November in the United States. Academic papers should be submitted through the ASOR’s website (www.asor.org/am) by February 1, 2017. Final award selection will be determined by the ASOR program committee. New Fellowship – ACOR Fellow MESA Award: One award of $1,000 to a former ACOR Fellow of any nationality for participation in the Middle East Studies Association (MESA) annual meeting. Eligible applicants are graduate students or post-doctoral scholars who had previously been awarded any ACOR Fellowship and whose abstract has been accepted for presentation at the 2017 MESA annual meeting. Former CAORC, NEH and fellows from our ‘named’ scholarships or our scholarships for Jordanians are eligible. Former Critical Language Scholarship (CLS) students of Arabic who were resident at ACOR between 2006 and 2012 are also eligible to apply. For more information, please see our announcement on MESA’s website: http://mesana.org/professional-opportunities/grants-competitions.html#ACOR. Other fellowships administered by the Council of American Overseas Research Centers (CAORC) are available. Please visit http://www.caorc.org/fellowships to learn more.